Welded steel chains are one of the industries widest used chains. We stock both an import line and mad in the USA line of welded steel chains. We also can supply or fabricate custom and standard welded steel chain attachments and sprockets. 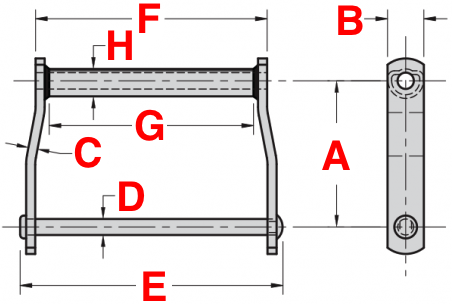 The most common style of welded-steel chain is the offset sidebar style, this ranges in size WH78 - WH200. When picking welded steel chain it is important to notate the part number designations. This is because different letters in the part numbers will designate the different styles or manufactured techniques used on the chain. Welded steel drag chains are manufactured with large carrying surfaces and are typically found in grain handling, mining, forestry, and mill applications. We stock both an import line of welded steel drag chains as well as a manufactured in the USA series. All of our drag chains are manufactured to American standards and conform to industry standard dimensions so they interchange with other brands and manufactures. 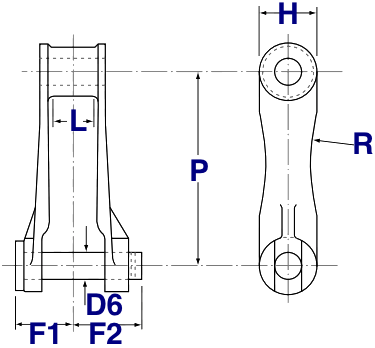 Below is a drag chain size chart as well as part number nomenclature. Straight sidebar welded steel chains are manufactured for heavy-duty conveyor applications. These chains will operate on the same sprockets as offset welded steel chain and can travel in both directions. Below is a drag chain size chart as well as part number nomenclature. WHX series chains are dimensionally the same as WH series chain with the exception that WHX series chains use "case hardened" pins instead of the standard through hardened. These chains are typically found in grain applications as well as forestry and heavy-duty conveying applications that have high shock loads. Read the comparison below between case hardened and through hardened for additional information. Case hardening is the process of hardening just the surface of the part, also commonly known as carburizing. In the case hardening process, the low carbon component is placed in a furnace which contains a carefully controlled carbon atmosphere. It remains there for a period of time so the carbon soaks into the parts surfaces to a predetermined depth. When the part is heat-treated, the high carbon surface layer becomes hard while the low carbon core remains comparatively soft. Through Hardening is done where the iron mix contains a certain amount of carbon. Carbon dissolves in molten iron just as sugar would dissolve in coffee. In through hardening steel, there is a high level of carbon added to the iron mix. When the component is heat treated, it becomes hard all the way through from the surface to the core. This is why the term "through hardened" is used. Through-hardened steel is a lot more brittle and can fracture under impact or shock loads while the case hardened steel has a softer core which drastically reduces the possibility of a fracture or breakage. In recent years, wastewater treatment facilities have begun to incorporate some welded steel chains in their operation. Wastewater chains are put through some of the harshest environments and applications in the industry, due to the high-strength and durability of welded steel chains they have started being used in wastewater applications. Typically these chains will be accompanied by an F226 or F228 flight attachments for flights. We also supply wastewater sprockets for this chain! To get a quote on welded steel chain fill out the request for quote form and someone from our customer service team will contact you.